Circa 1913. This historic gem truly is a treasure, surrounded by the coastal beauty of La Jolla. The home was designed for George Kautz and was built by Irving Gill in his Cubist style. John Philip Sousa and his family lived in the house for several years during the 1920s. 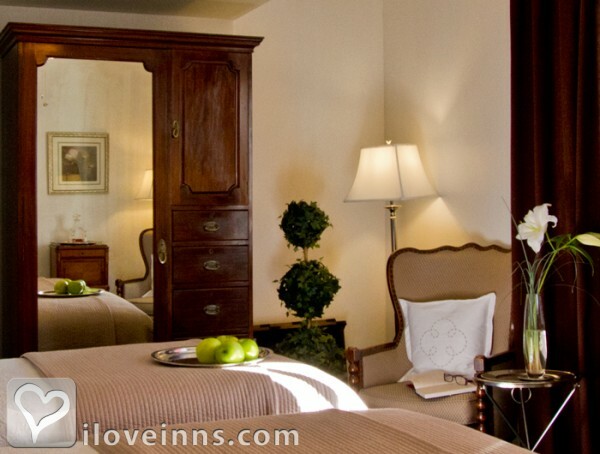 The guest rooms and suites offer beautiful furnishings and romantic d�cor. The Holiday room includes a massive four-poster, canopy bed, hardwood floors accented with antique Oriental rugs and a fireplace. 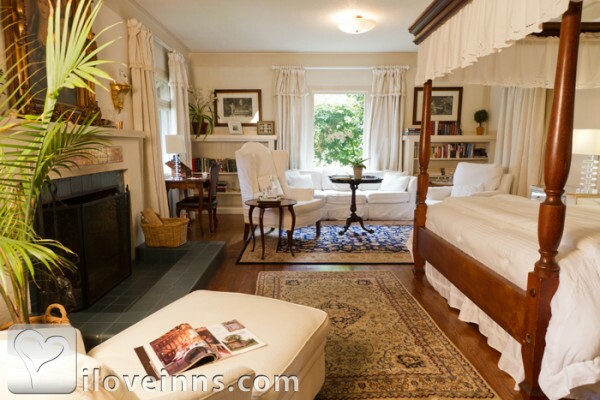 Other rooms include amenities such as clawfoot tubs and fireplaces; some rooms offer ocean and sunset views. The gourmet breakfasts are a treat, rivaled only by the setting. Guests partake of their morning meal either in the dining room by candlelight or in the high garden. 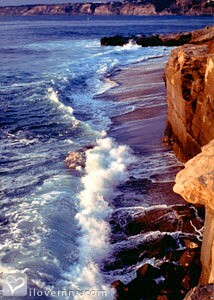 Californians have long enjoyed the splendor of La Jolla, a charming village with a spectacular coastline. Guests can walk to the many unique shops or take a stroll along the beach and enjoy an unforgettable sunset. 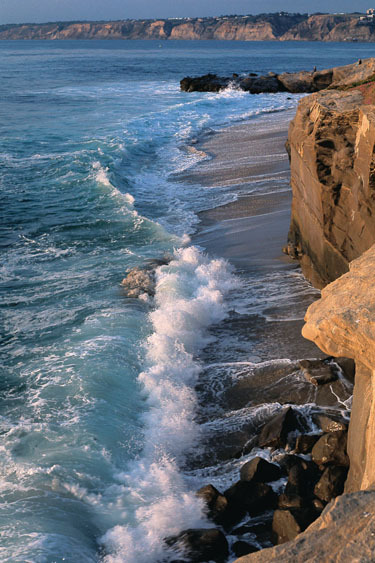 A short drive out of La Jolla will take guests to the myriad of sites in San Diego. After a day exploring the area, guests return to the inn and enjoy a sampling of wine and cheese. Payment Types Accepted Include Visa, Discover, Travelers Checks, American Express, Master Card and Personal Checks. This property has 15 total guest accommodations, 13 with private bath, 8 with fireplaces, 2 suites and 1 conference room. The types of beds available include Twin, Queen and King. Limited free parking, complimentary local phone calls, an early morning breakfast baggie to take on the road and if traveling solo you may invite a business associate for a power breakfast with our compliments. Free Wifi. Lap desk and regular desk for your comfort and convenience. Ideally located 1 block from the beach for romantic coastal strolls and sunset picnics on the cliffs as well as only a few blocks from the village and candlelit gourmet dinners. 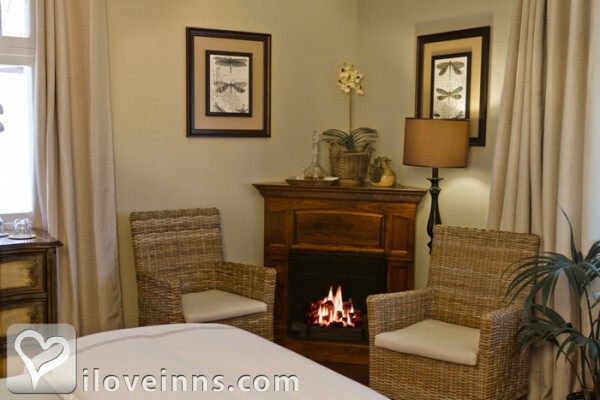 The inn itself offers rooms with cozy fireplaces and fine sherry for snuggling and relaxing on those rare chilly nights. 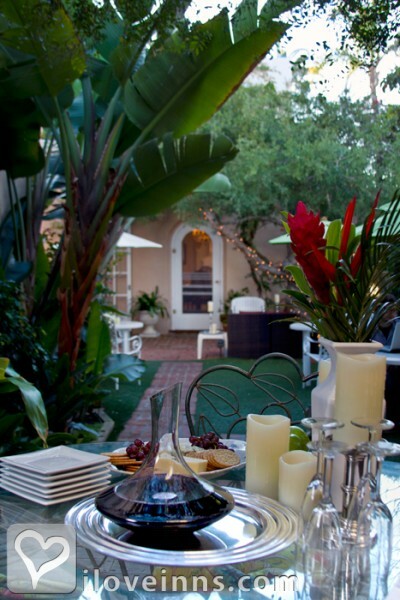 Sun drenched patios and lush gardens are perfect for lounging about and enjoying the romantic ambiance of the Inn. PAII, CHCI, ABBA, CABBI, CIAA, Select Registry and Unique Inns. Filled with lush greenery and flowers the gardens are a paradise for humming birds. The sound of the fountain adds a lyrical note to the peacful surroundings. An Australian tea tree holds a place of prominence. Magnificent pink camillas boarder the entrance to the inn and bouganvilla drape the arches and patios in brilliant color. Delightfully, cozy room with period style built-in tub and pedestal wash basin. 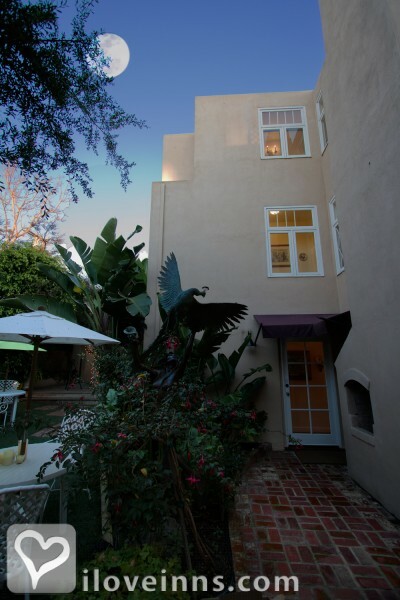 Ideal location in historical section of the home near 2nd floor Sun Deck and Library/Den. A suite without the price of a suite. Perfect for one and cozy for two. 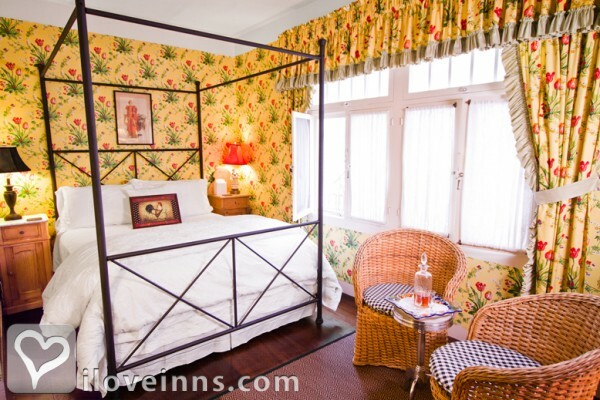 Colorfully decorated room in yellow floral prints featuring comfy chairs for reading and pine antique accents. Very private location. English Country style in floral and white fabrics with hunter green and burgundy plaid accents. Cozy antique table and comfy chairs for reading or relaxing. Also ideally located in proximity to the 2nd floor patio and library/den. Feels like home. 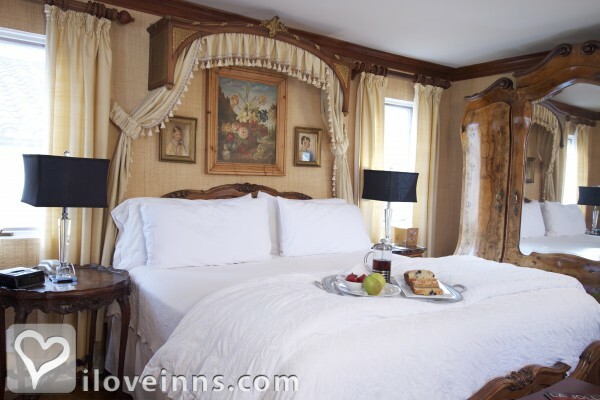 Quiet elegant bedroom furnished in traditional Queen Anne style antiques including a four-poster Queen bed. Color scheme is peach and cool mint with white accents. Comfortable seating and cozy fireplace. Light, bright room with a view. 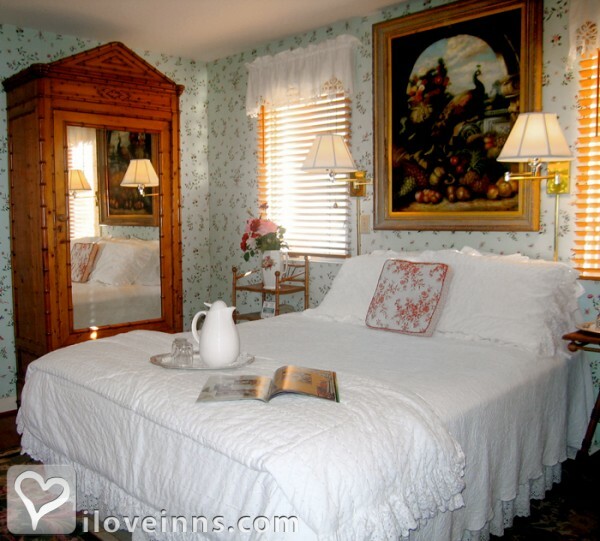 Four-poster iron bed and white wicker furniture. Contrasting peach walls and lovely garden prints. Fireplace. Patio and garden views. 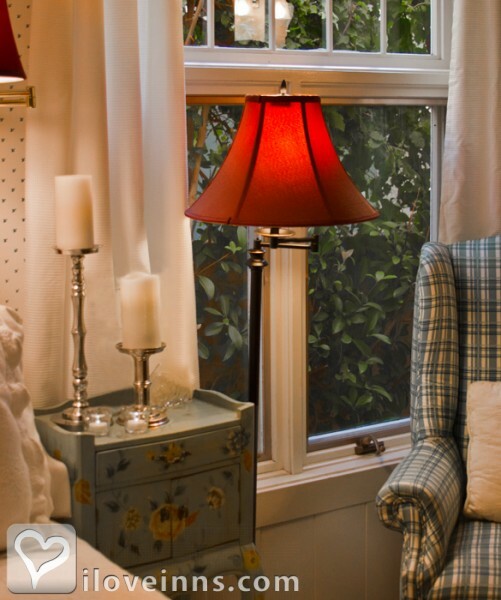 Cozy, brightly decorated room with private balcony and garden views. Furnished in a blend of Art Deco and Victorian antiques. Bird Rock Cottage has its own private entrance off the garden. A large room with large comfy chairs for reading and relaxing, it is done in a Laura Ashley style with mini prints, white accents and antique pine furniture. TV and fireplace. 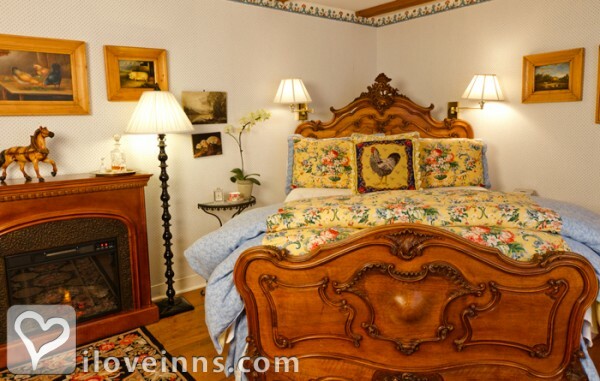 Spacious French Country style bedroom done in blue mini prints and bright floral fabrics. 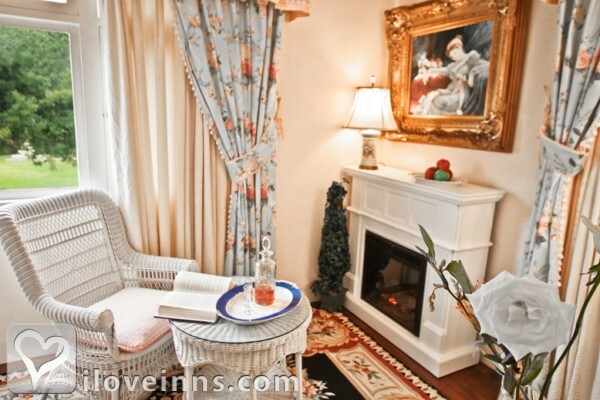 Delightful sitting area with TV, antique pine armoire, fireplace and marvelous antique bed. Light and bright and cheerful. Oriental/Victorian flavor with tortoise shell bamboo antique accents and soft colors. 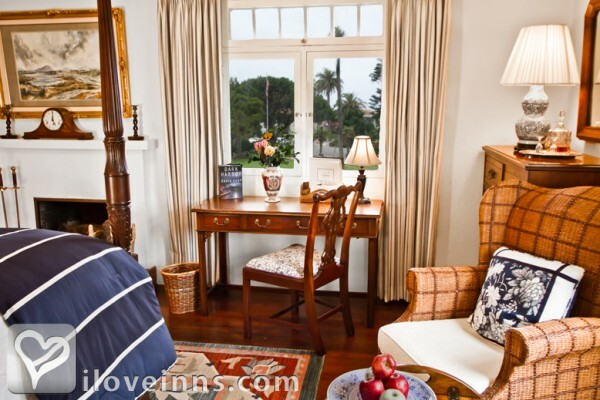 This special guestroom offers sunset and horizon ocean views and a fireplace to set a romantic mood. Secluded with its own entrance off the garden, this cottage-style guest room has a wood-burning fireplace and an original clawfoot tub. Mini prints mixed with a flourish of floral. Pacific View is one of the most requested guestrooms with its sunset and horizon ocean views. In addition to its lovely views, it offers a wood-burning fireplace and two very comfy wing back chairs and desk. Keeping to a nautical theme, the room is decorated in brilliant blues and whites. Elegantly appointed with marvelous antiques, this large bedroom has a Latin flavor and a comfortable sitting area with garden views, TV and fireplace. Private bath. The decor is white on white with cream and beige accents. The Holiday Suite offers a large wood-burning fireplace, TV, seating area with sofa and wing back chair, as well as an antique four-poster canopy bed and armoir. Truly an exceptional room. The penthouse has its own large rooftop patio with some ocean view along with a separate den/library equipped with cable TV. 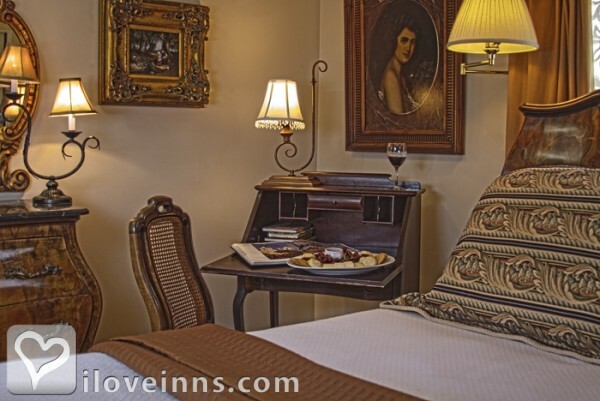 This is by far the most elegant and spacious of all the guestrooms and the largest of the two suites with fireplace, relaxing sitting area and one-of-a-kind European antique bed and armoire. 2 nights on weekends. 3-6 for special events and holidays. Call Inn for specifics. Can accommodate 12 years and older. Cancellations/Changes are subject to a $50 processing fee per room or 3% of total charged to credit card, which ever is greater. 14 days prior notice is required for stays totaling 4 room nights or less, 30 days prior notice for stays totaling 5-8 room nights, 60 days prior notice for stays totaling more than 8 room nights. No-shows and early check-outs are non-refundable. Cancellations received less than the appropriate days notice are non-refundable. Reservations made for Special Events, Holidays and their minimum stay requirements as well as stays in June, July & August are non refundable. Discounted stays are also non refundable. One of the best examples of Irving Gill's "cubist style" architecture from the early 1900s, Home to Johh Philip Sousa familly in the 1920s, and the gardens were created originally by Kate Sessions, famous for directing the landscaping of Balboa park at its inception. Awarded "Best Location" by Inn Magazine several years in a row. Also received " "San Diego's Best" award over the past years. 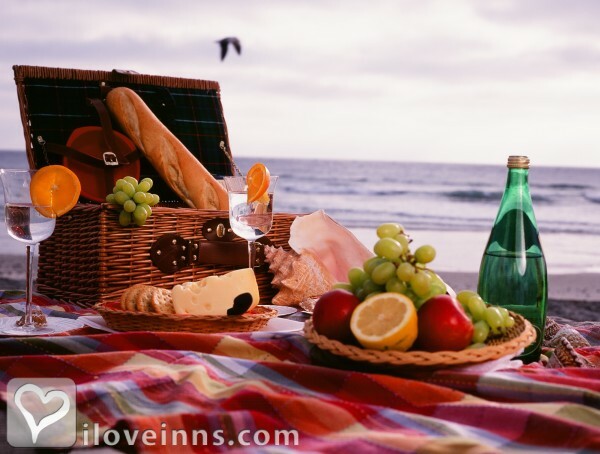 We recently stayed here for three nights to attend the Breeder�s Cup at Del Mar Race Track. Pros: 1) Inn is located in a quiet area that is safe for walking at night. 2) Inn is located a short walk to the ocean (not the beach). There is a sidewalk along the coastline for a leisurely walk to enjoy the ocean view. 3) Inn is located a short walk to restaurants where the locals eat � choice of Italian, Mexican, Chinese, pizza, fish. 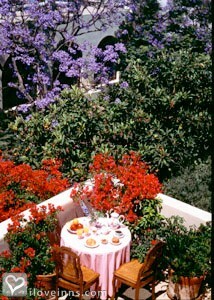 4) Delicious breakfasts served and seating available in the dining room or the lovely garden. We were served a delicious and beautifully presented breakfast on all three mornings of our stay. However it was a surprise, with the pretty table settings and the lovely garden in which to sit, that the coffee is served in paper cups. It did distract from the ambiance and the paper cup with hot coffee was difficult to carry to the garden to enjoy before breakfast was served. 5) Shelley greeted us warmly on arrival and she was certainly very friendly with every encounter during our stay. Cons: 1) Housekeeping consists only of a stack of clean towels put in the bathroom and used towels removed. The beds were not made, the trash was not emptied, the used coffee cups not removed, the bathroom amenities not replenished and the sherry glasses not washed or replaced. On the second day we specifically asked Shelley for the room to be serviced and left note on our door requesting service and still the housekeeping service consisted of putting a stack of clean towels in the room. It was disconcerting to return from a long day at the races and find the beds unmade and absolutely nothing done. To add insult to injury there was an envelope provided for gratuities. It remained empty when we departed. 2) The beds in The Shores room were extremely and uncomfortably hard. If you do not like extra firm mattresses do not stay in this room. I will not return to the Inn. I suggest that people planning a trip to this area look at the many other lovely lodging choices. You will find another place to stay that will provide you with better housekeeping service (at the least the beds will be made each day. Couldn't have found a better place to spend our last night in San Diego. Wish we could have spent them all here. Wonderful place to relax and enjoy the scenery, an exquisite room and excellent service. We hope to return again. It has been wonderful to leave behind all the daily stresses and just be with my sweetheart and feel my growing love for her. I am grateful. After one year together, this was the perfect way to celebrate the year to come. Fireworks by the sea and the glow of fireworks from our bay window we leave here with memories and anticipation for the year to come. This was the a great place to celebrate our anniversary. After one year together, this was the perfect way to celebrate the year to come. Fireworks by the sea and the glow of fireworks from our bay window, we leave here with memories and anticipation for the year to come. This was the a great place to celebrate our anniversary. The celebration of our 25th wedding anniversary was everything we had hoped for� The room was wonderful, the weather was perfect, the companionship was great. Thanks for the wonderful time! Innkeeper was personable and delightful. Breakfasts were delicious and creative. Common table inspired visiting with other guests. Great Father's Day. My boyfriend and I decided to stay at a B&B for the first time and we could not have had a better experience. The room was spotless and clean, the bed was extremely comfortable, the breakfast was absolutely delicious. We also enjoyed having a private balcony connected to our room. The innkeeper was very friendly and hospitable and was able to recommend a great restaurant for us to go to dinner. We plan on coming back very soon! 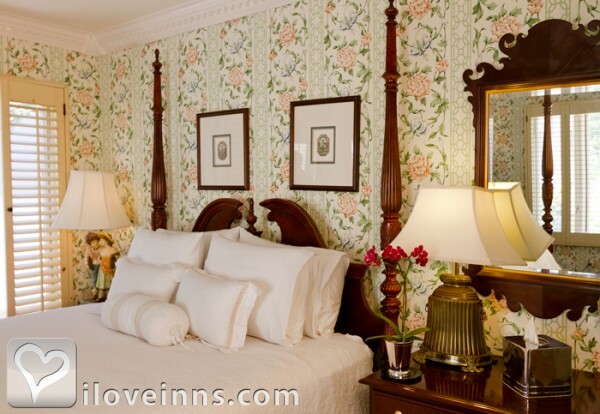 My boyfriend and I stayed at the �Ellen Browning Scripps� room on our first night and the �Holiday suite� for the next three nights. The Ellen Browning Scripps� room was small, but quaint; however, this room does not offer any type of view so if you desire a lot of space and views, you may want to consider another room such as the �Holiday suite.� The Bed & Breakfast Inn had a great comfortable and cozy feel with picturesque windows yielding plenty of light. The holiday suite was perfect and offered nice views of the courtyard and park across the street. 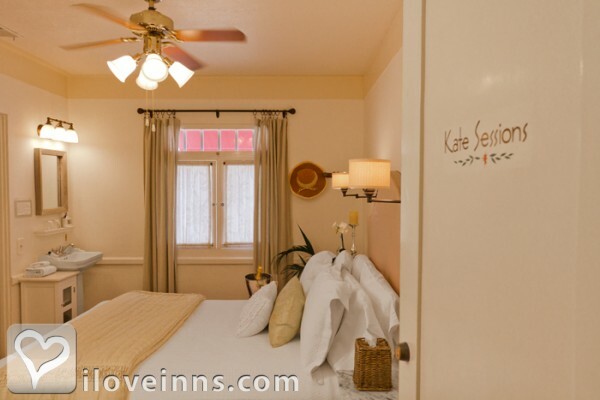 It boasts original wood floors, nice bright windows, and white linens to emphasize cleanliness. The bathroom of the holiday suite was large with an oval-sized tub. If you desire 'space' or the possibility of entertaining a few guests while in La Jolla, this is a perfect suite for that. The beach is right behind the Museum of Modern Arts, which is right across the street from the bed and breakfast. The courtyard is quiet and tranquil with one small fountain and plenty of local plants (e.g., hostas, lilies, hydrangeas, and etc.). However the biggest assets to the bed and breakfast are; Margaret and Steve who are remarkable at entertaining and making all guests feel at home. They are down to Earth, personable, and quite frankly they made it feel like we were staying with extended family members. The breakfast was delightful and home-made by Margaret, an Ireland native during the week and by a different gourmet chef during the weekend. To be honest, I could not tell them apart because all the breakfasts were excellent. Each breakfast commenced with a fruit of sorts, followed by a gourmet egg dish (e.g. Frittata, quiche, etc.). The egg dish featured a side dish of sausage and one or more vegetables with a fruit-based salsa/compote. The finale to breakfast featured some light dessert (e.g., sorbet, Italian cream, and etc.). Homemade cookies and coffee cakes are available in the lobby throughout the day, in which are usually contributed by Steve. The Calabria Coffee and European hot teas are served with milk or cream throughout the day, in which is great. Finally wine and cheese are available around dinner (4 or 5pm), in which features a good red and white wine. The cheeses include; brie, blue gorgonzola, and Swiss. The cheese is served with fruit, mixed nuts, bruschetta, and other items that vary. In summary, we are well traveled and this bed and breakfast is a steal for the quality, service, and food provided!!! I would recommend this bed and breakfast to anyone and I would rather stay there than any other hotel in the area. Further the breakfast provided cannot be beat by any of the surrounding area restaurants and hotels. Showcased in Elegant Living Magazine 2013, Victoria Magazine, New York Times, Los Angeles Times, Glamour, Country Inns, Travel & Leisure, Voted "San Diego's Best"., ABC.